Predator Combatives is introducing the Combat Shroud for popular models of Glock pistols. These shrouds encapsulate the muzzle and slide in front of the ejection port, allowing the guns to function normally if grabbed or manipulated. The point of the Combat Shroud is to protect the gun and keep it running in situations where gunfights turn to grappling contests. To some, this may seem like a gimmick but to others, it could be a real life-saving device. It can also aid with rapid strings of fire as it incorporates a “gas pedal” thumb rest for a thumbs-forward grip. This allows shooters to push down on the muzzle to counter muzzle rise from recoil. It also adds mass to the frame which also helps cut down on felt recoil. It’s less than an ounce but it’s at the muzzle end of the gun where it does the most to mitigate. Predator Combatives is offering the Combat Shroud for full-size and compact Glock models 17, 19, 22, 23, 31 and 32. They are compatible with Gen 3 and Gen 4 Glock pistols with a separate series for Gen 5 guns. The Combat Shrouds are constructed from 7075-T6 alloy aluminum with a hard coat anodized finish. They’re strong enough not just to resist attacks, but to be used as a striking tool if necessary. Predator Combatives offers different style faceplaces including their Mallet and Striker patterns. The design inherently prevents some slide manipulation techniques but it is compatible with red dot sights which are becoming increasingly popular on duty and carry guns. Predator also offers modified shrouds that will accept accessories including lights and laser sights. The system is going to need holster support down the line to see a lot of success but as a test product it will probably do fine. Predator Combatives will de-horn their shrouds for comfortable in-the-waistband carry. 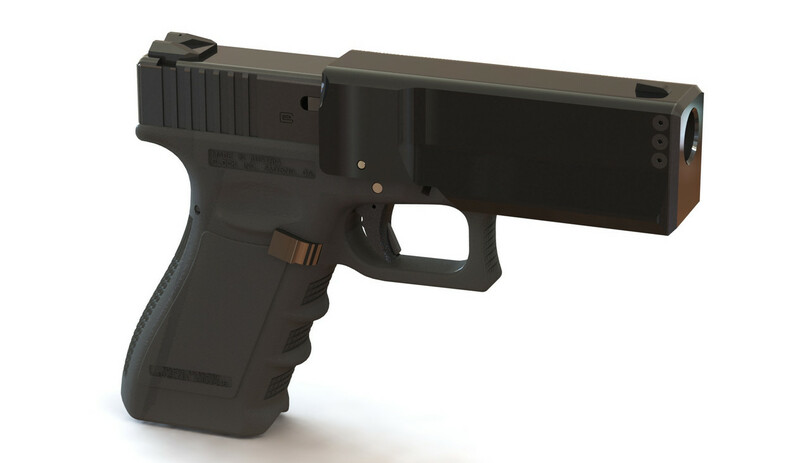 The idea of a grapple-resistant firearm has clear appeal to security and law enforcement officers and anyone else who has a reason to forsee up-close encounters. There are two main ways an attacker can disable a semi-automatic very easily if they know what to do or just get lucky. The first is to simply push the slide out of battery. With the slide out of battery most duty guns will not fire, and if they somehow do, the gun will likely fail catastrophically. An attacker can also hold the slide in place. This doesn’t stop the gun from firing, but it can prevent the slide from cycling and loading another shot. This can take a gun out of the picture for the duration of the fight. 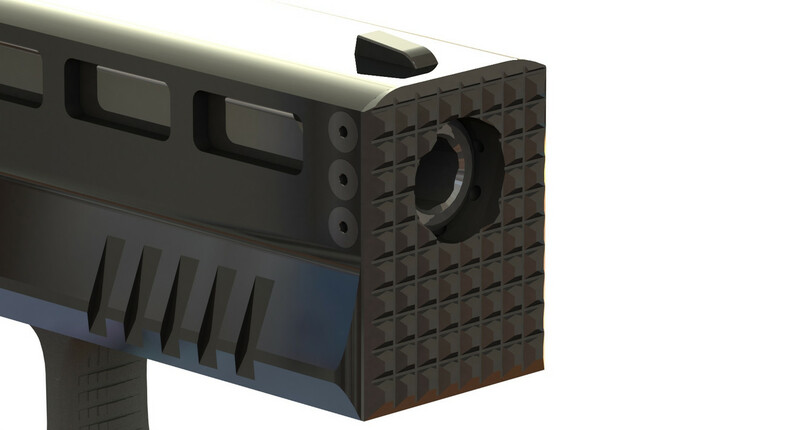 This device gives the shooter a better chance of getting in a shot in a life-or-death situation. While some defensive gun practitioners would say don’t get in that situation in the first place, others are probably wishing they had thought of this first. Guns and golf are two places to make things that are not needed and find people willing part with their money for them. Well kudos to Predator Combatives! They managed to make a really ugly pistol even more ugly! It seems to me that this device a solution in search of a problem. Those who mock this idea have obviously not been through any sort of CQB training. This is a decent idea, and here’s why: you never know exactly WHAT type of situation you will be in. It is absolutely impossible to be 100% prepared for absolutely everything. For example, if an attacker does get the jump on you (because that is where self DEFENSE comes in to play) and they get you on the ground, you very well may have to press the muzzle into their stomach in order to get a good shot. Or else they will probably try to grab the gun when they figure out you’re armed, with your arm flailing around in the breeze. If you press the muzzle of an automatic against something, what happens? It usually pushes the slide and barrel back enough to push the gun out of battery. Now you’re dead. How about if you draw on an attacker at closing distance, but his friend jumps you from behind and grabs your gun? You can fire a shot, maybe. But if he has control of your muzzle your auto becomes a paperweight. Now you have to create distance in order to rack your slide and chamber a fresh round, oh but he also had a knife so you now have a gnarly gash to your lower abdomen and are losing blood fast. Dead. But no, I get it. All of the tacticool operators out here have 360 security at all times, and walk the malls at the low ready waiting for some bad guy to exclaim that he is in that location for nefarious purposes. Roger that, don’t get too much of your own blood on to your $400 tactical ninja ghost pants bro. Seal team 6 is on it’s way. Oh ya and what about the balance of the weapon? I would wager accuracy will decrease slightly. But you don’t need to worry about that because you are shooting guys in stabbing range. Glocks are designed to flex when fired. If this inhibits that, they will be less accurate. Jury is out on this one. Some say the most important attachment to have on your secondary is a light, especially given that most actual CQB or self defense would occur in low light conditions. Generally speaking that is. I’m sure you have an example from personal experience about this not being true while you wear $30 Levis. I could go on. Btw I wear $300 combat pants but you were close. Alibi: DEVGRU can’t work within the states due to Posse Comitatus unfortunately but if they did we would have a whole lot more really cool books and movies. (1) Open toilet lid; (2) Drop in cash; (3) Flush. I can see the idea behind this…however why not train in firearm retention? If you allow someone close enough to touch your weapon you have already failed. In my opinion training rather than gadgets works best. Another toy to waste money on. Why not hire a full-time body guard? Ok, but what are the odds of such a situation for the average everyday American??? I can see it for a Cop, but really? And now you’ll need a new holster. No, it not a stupid idea. It is recommended that revolvers for home defence have short barrels to make it hard for an assailant to grab and control. With autos, you have the additional problem of jamming the gun. And think about the distance a perp can cover before you can draw and fire your gun. Something like 17 feet. How about a glove box with a hole on the outbound side so the bullet can exit? Then, the entire hand is inside a giant box and the perp can’t even touch it! Or, a hole in a wall? Stand safely on the other side……You get the idea….